What do a ceramic tureen, a Welsh wooden love spoon and a cricket bat have in common? All three were displayed in the recent exhibitions Snapshot Photography Migrant Women: A Tasmanian Experience and Everyone is Human: Stories of Recent Migration, and they have now been generously donated to the Tasmanian Museum and Art Gallery (TMAG) Collection. TMAG senior cultural heritage curator Elspeth Wishart said the museum had identified some time ago that its collections were not representative of the migrant experience. 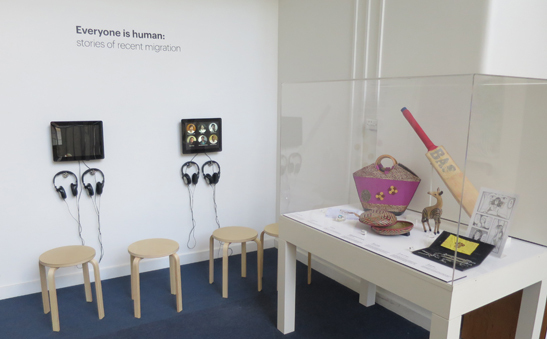 “Apart from a small number of items, we recognised a gap in our collections and were determined to work with the migrant communities to address this issue,” Elspeth says. 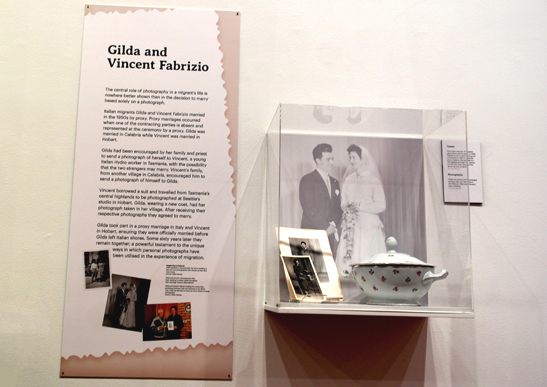 The ceramic tureen tells the story of Gilda, a proxy bride who sent her photo from Italy across the world in the 1950s to a young Italian Hydro worker, Vincenzo, who was based in the Central Highlands. Vincenzo borrowed a suit and travelled to Hobart to have his photograph taken at the Beattie studios. The two photos were exchanged, the marriage was arranged and weddings took place with the photos as stand-ins – then, suitably married, Gilda set sail for her new life in Hobart to meet her husband. Amongst Gilda’s trunk and clothes was a dinner set for 12 given to her by her mother-in-law. Over the years much of the china was broken or chipped but the tureen has remained unscathed for over 60 years, and is a testament to a new life in a new country. The Welsh wooden love spoon was brought to Tasmania by Eva Mehegan’s father, Harold Lunn, who ran a family business that operated large steam-driven traction engines in England. In 1951 he announced to his family that he was moving the business, staff, and his family and machinery to Tasmania. Harold was originally a Welshman and amongst the steam engines and personal belongings he brought with him, the spoon was a reminder of his roots and has remained in his family until now. The cricket bat belonged to Prajit Parameswar, who came to Hobart from his native city of Goa in southern India to study at the University of Tasmania in 2006. He brought his passion for cricket with him and soon joined the St Virgil’s Cricket Club where he used the bat to score a century in one of his first games. In 2012 Prajit helped found the Summerleas Eagles Cricket Club, a multicultural team with players from India, Pakistan, Bangladesh, Nepal, Kenya, Saudi Arabia, Sudan and Australia. The club aims to bring together players from a broad range of cultures and ethnicities, uniting them with their love of cricket. It plays in the Huon Channel Cricket Association and has won two championships in its four seasons of play. “As well as these items, a program has commenced to document through oral history recordings the stories of more recent migrants who have made Tasmania their new home,” Elspeth says. If you know of any items or stories relating to the migrant experience that you think the museum should collect, please contact senior cultural heritage curators Elspeth Wishart or Ian Terry.